Ahead of this past weekend, Bollywood was set for a showdown of superstar Shah Rukh Khan’s romantic musical action comedy and period war action romance drama starring Quantico‘s Priyanka Chopra and Deepika Padukone. It was expected before the weekend that SRK would have the majority of screens and come out on top — and I expected the movie to be among the top international players in a weekend where would dominate everywhere else. Any movie with Bollywood mega-stars is an event that grabs the country, but the effect of having two at the same time appears to have divided it. Both films ended up ranking at about No. 4 and No. 5 globally for the weekend. That’s as compared to, say, Salman Khan’s recent Prem Ratan Dhan Payo, which debuted to $31M and No. 2 on the international charts. This should be of concern for a major date next year when SRK goes up against his sometime rival/sometime pal, Salman Khan on the lucrative Eid holiday. It also comes just ahead of Star Wars‘ debut in India — one of three markets Disney held back from the day-and-date release. Dilwale (which means big heart and shouldn’t be confused with the fall Hindu holiday of Diwali) had more than just the competition from Bajirao Mastani to be concerned about coming into the weekend. SRK, arguably the industry’s biggest global star, had recently made comments which sparked the ire of right-wing groups. In November, he reportedly said at a press conference that “religious intolerance and not being secular is the worst kind of crime that you can do as a patriot.” He later appeared to apologize for the statements but, per NDTV, told media in Calcutta his comments were “misconstrued” and that he did not say anything for which he should apologize. “What I want to say I speak. But lot of things I say are… perhaps mispresented. People know me. Perhaps they did not understand what I said.” It is thought this brouhaha led to protests and screening cancellations at some of the Dilwale theaters and allowed Chopra and Padukone’s film to muscle in. There’s no question Dilwale was the bigger earner at the weekend. 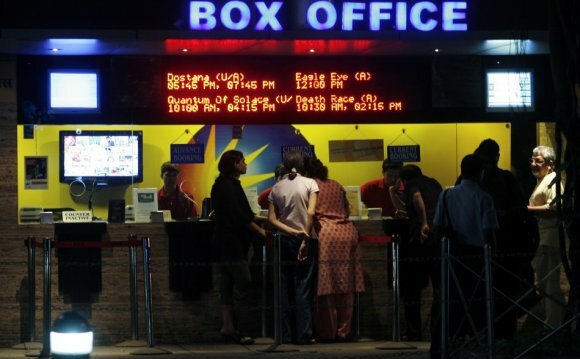 It grossed $9.8M in India and about $8.5M abroad. Mastani took $7M at home and approximately $4.5M overseas. Both movies broke into the Top 10 in the U.S at No. 9 and No. 10, respectively. But that Dilwale number is only SRK’s fifth-highest opening in India ever. On Monday, Mastani moved up the Indian charts to slightly overtake Dilwale for the day. This was after Dilwale saw a 50% decline on Monday from its opening Friday, per box office analyst Taran Adarsh. Bajirao Mastani is directed by Devdas‘ Sanjay Leela Bhansali and also stars Ranveer Singh. It’s been met with very strong reviews.